The Bataan Memorial Death March is a challenging march through the high desert terrain of White Sands Missile Range, conducted in honor of the heroic service members who defended the Philippine Islands during World War II, sacrificing their freedom, health and, in many cases, their very lives. Since its inception, the memorial march has grown from about 100 to some 6,500 marchers from across the United States and several foreign countries. 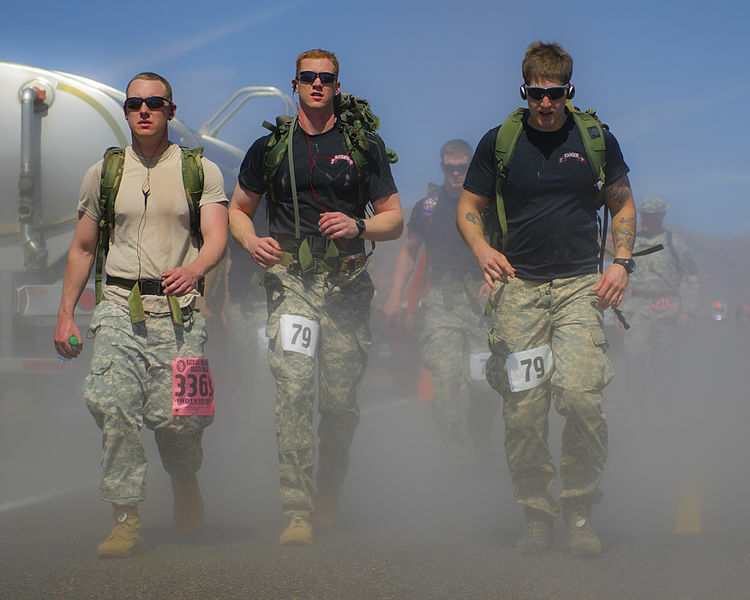 While still primarily a military event, many civilians choose to take the challenge. Marchers come to this memorial event for many reasons – personal challenge, the spirit of competition or to foster esprit de corps in their unit. Some march in honor of a family member or a particular veteran who was in the Bataan Death March or was taken a prisoner of war by the Japanese in the Philippines. From the start line (blue star at the South end of the map) the routes go counterclockwise. The numerically-marked (1-12) blue drops indicate the water points. The red stars indicate medical stations. The 14.2-mile route is essentially the lower portion of the 26.2 mile course. On the 26.2-mile course, the route proceeds Northwest from Water Point 4/8, circling a small mountain known as Mineral Hill. Returning to Water Station 4/8, marchers travel south along the paved road covered earlier in the route. The course then veers West along dirt and sand trails, coming up the backside of the White Sands community and returning to the finish line. The area know as the “Sand Pit,” featuring deep sand, comes after Water Station 9. But, be aware, the dirt trails elsewhere along the route can be sandy and dusty as well. This is particularly true of the stretch between Water Station 1 and Water Station 3. Each year in southern New Mexico, a unique event is held in honor of a very special group of Americans, the Battling Bastards of Bataan. 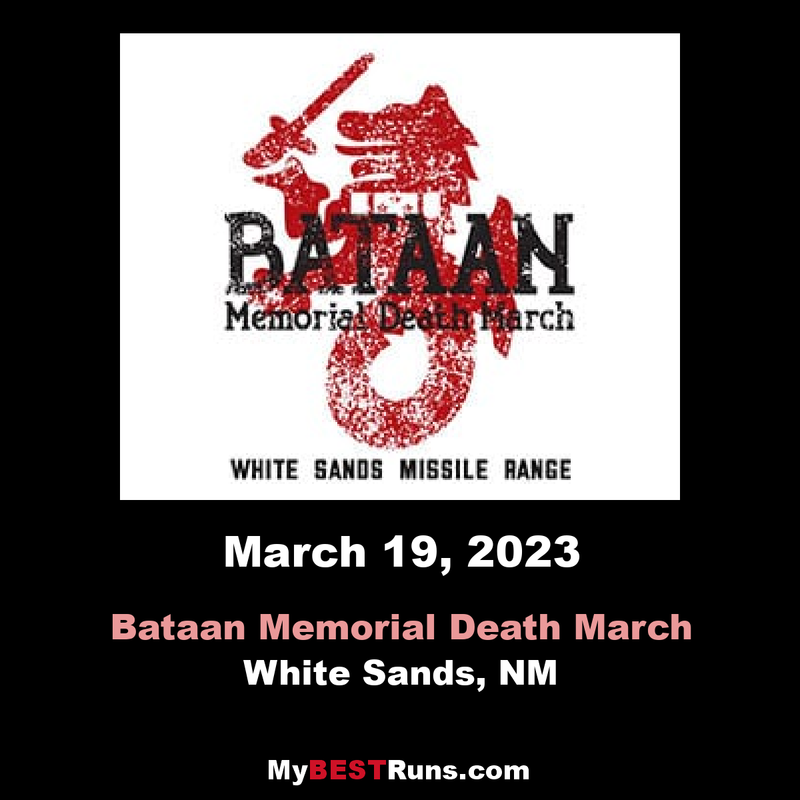 People from virtually every state in the United States and even other countries around the world converge on the Chihuahuan Desert of New Mexico to take part in a grueling 26.2-mile trek through the desert known as the Bataan Memorial Death March. The Battling Bastards of Bataan symbolize a great generation, one whose values and sacrifices leave their descendants in a debt of gratitude. I like to think that those who participate in this event do so for the same reasons I do - simply to remember, honor, and thank that group and their generation. And while the ranks of Bataan Survivors diminish, the event that honors their sacrifices and those of their fallen comrades grows ever larger.They will not be forgotten.